Planning a trip to Machu Picchu can be stressful (I know; I’ve done it twice! ), so I’ve put together a list of 15 things I wish I’d known before visiting Machu Picchu. I hope this helps! 1. It’s worth getting there early. I can’t stress this enough: Get there early (first bus from Aguas Calientes leaves around 5:30, getting you there at around 6am). This is the prime time to get a serene feel for the site. By 11 a.m., it will be so crowded you can hardly walk through some places, and everyone will be lining up for the same shot. Think of it as visiting a dream destination with 2,000 of your closest friends! 2. “Jumping pictures” are not allowed–but people do it anyway. You are not supposed to jump at Machu Picchu; I guess they’re worried about you falling or breaking something. However, lots of people do it and just risked getting yelled at. 3. There is no evidence that there were human sacrifices in Machu Picchu. While concrete evidence has been found that shows the Incas did offer up human sacrifices elsewhere, there has never been any proof that that was what Machu Picchu was used for. Some tour guides will try to hype it up and make it sound like Machu Picchu is where they slaughtered human beings, but that’s simply not true. The true facts about the history of Machu Picchu are plenty interesting without the use of embellishment. 4. Do not book tours ahead of time if you can help it–they often cost double just to book online. Expats and locals alike in Cusco have heard their fair share of stories from visitors who’ve been ripped off by tour companies. 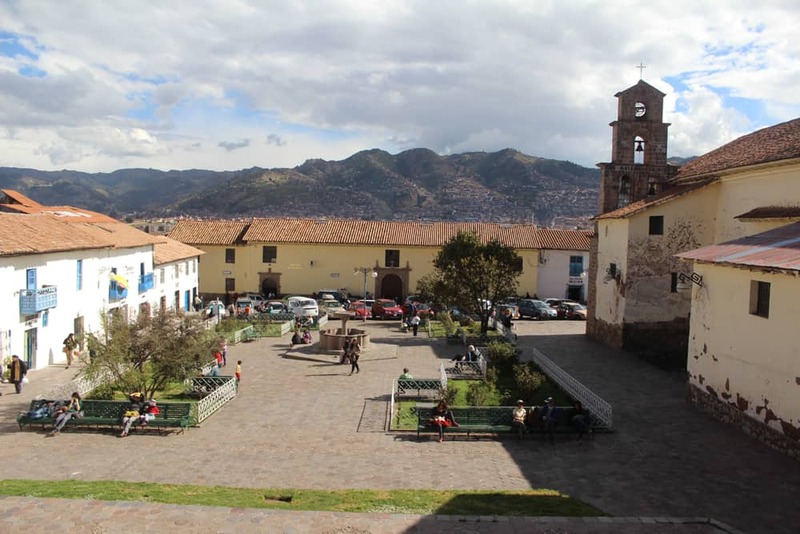 If you book online while you’re in your home country, prices can be double what you’d actually pay in Cusco itself! If you can wait to book tours until you arrive, then by all means, do so. Google average prices for tours in the area before booking. For example, a 5-day Salkantay Trek to Machu Picchu should NOT cost $600 (which I’ve heard people do pay when they book online). 5. There are three ways to get there: By train, by bus, or by hiking. 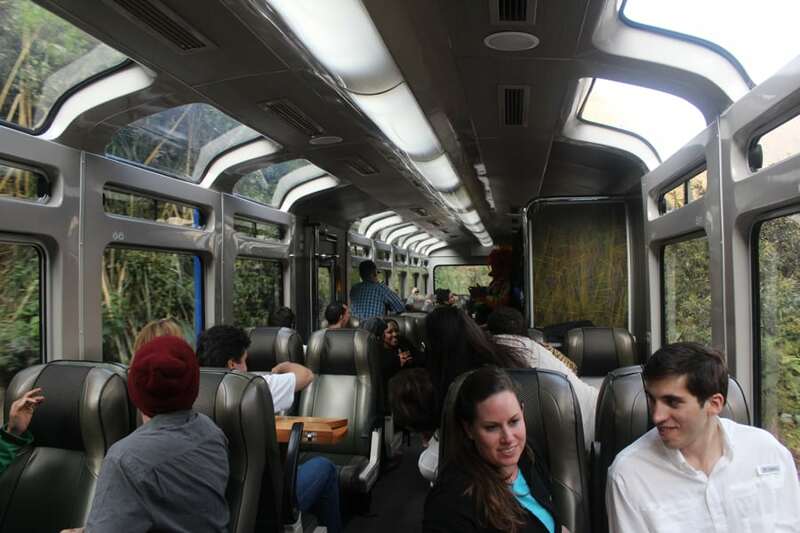 Inside the PeruRail Vistadome train, one step up from the Expedition train. There are two trains that go to Aguas Calientes (the town closest to Machu Picchu): Inca Rail and PeruRail. For more information on both, see my blog post about trains to Machu Picchu. There are many hikes you can take to Machu Picchu. 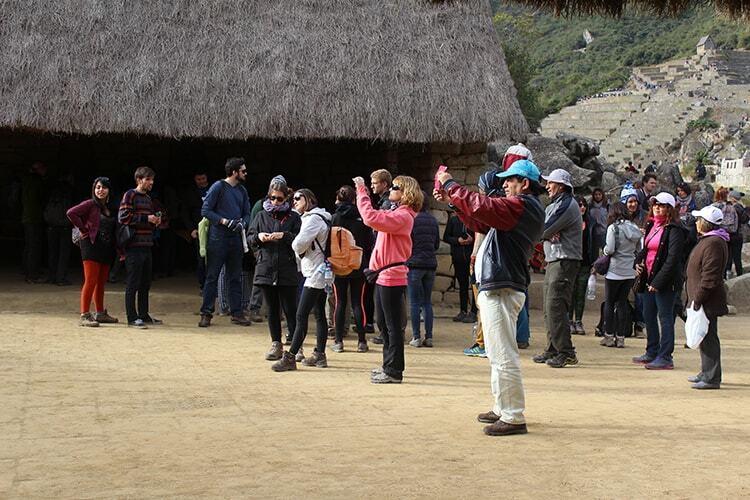 The most popular is the Inca Trail, four days and three nights. The lesser known option is a bus from the Hidroelectrica to Aguas Calientes. 6. 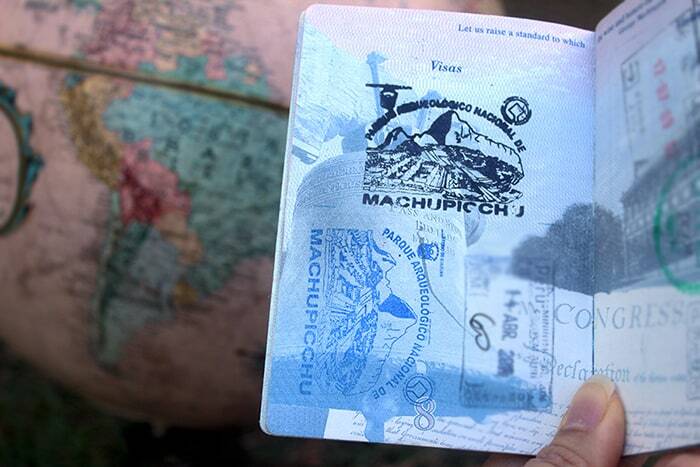 You can get a Machu Picchu passport stamp for free. When you exit the Machu Picchu gates, look to your right. 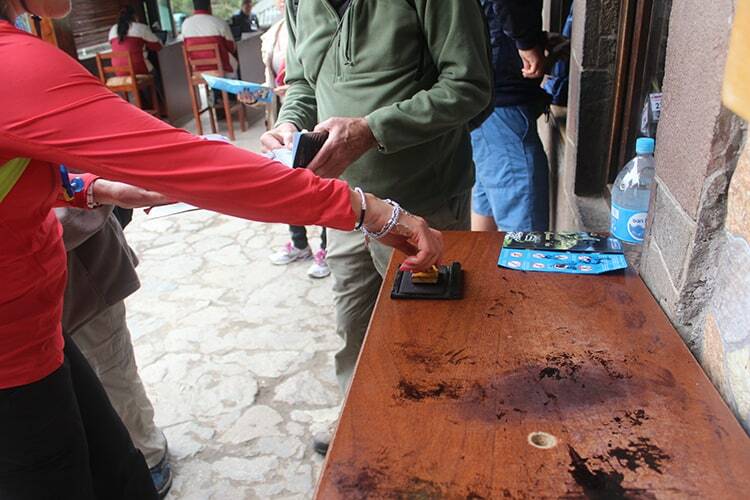 There is a little table with a special Machu Picchu stamp for your passport. Sometimes you can do it yourself; other times an employee will be handling it for you. 7. You can wait until last minute and get a tour guide at the entrance gates. It’s not recommended because you may know nothing about their background, but if in a pinch, you can wait till last minute and just grab a tour guide at the gate when you get to Machu Picchu. There are always plenty there. 8. There are no bathrooms and no places to buy water or food once you get inside the gates. Be prepared. Bring lots of water and snacks. 9. You have to pay to use the restrooms located at the entrance. It costs 1 Peruvian Nuevo Sol to use the bathroom at the gates. 10. You can pet the llamas. 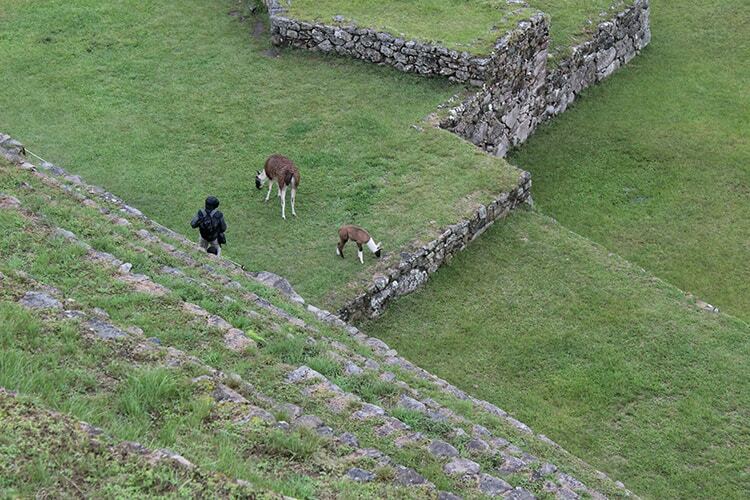 Lots of llamas live in the actual Machu Picchu site, and they’re friendly! It’s totally fine to walk up to them and pet them. They are used to this. 11. You are always being watched. Thinking of doing something silly? Don’t try it. There are employees posted up everywhere; sometimes you don’t even see them–but they see you. The second time I went to Machu Picchu, I found a hidden trail behind the Sun Gate and decided to explore it. Bad idea. Out of nowhere, an employee approached me and accused me of trying to pee in the woods. For the record, I WAS NOT. 12. There is a hidden Machu Picchu museum. The Museo de Sitio Manuel Chávez Ballón requires a separate ticket of $8. It’s hard to find though. It’s located at the base of the footpath leading up to Machu Picchu. From the town of Aguas Calientes, it’s about a 30-minute walk to the museum. 13. That tall mountain you always see in Machu Picchu photos? Its name is Huayna Picchu. The mountain called Machu Picchu is actually on the opposite side. Of all three, the Machu Picchu + Huayna Picchu sells out the fastest! That’s because they only allow 400 entrants to Huayna Picchu each day. So if you plan on climbing this, be sure to buy tickets far in advance. If you’re going to buy your tickets online, buy them only from this official site: http://www.machupicchu.gob.pe. Otherwise, you can buy your entrance tickets once you get to Aguas Calientes. 15. There is only one hotel that is actually AT Machu Picchu, just before the gates, and it costs $1,000 a night. The name is Belmond Sanctuary Lodge. Rooms here book fast, so if you plan on splurging on your trip to Machu Picchu, book a room here far in advance. Otherwise, you’ll have to stay with the rest of us peasants at the bottom of the mountain in the town of Aguas Calientes. Check out my other posts about Machu Picchu! Search for hotels in Machu Picchu! I love the article, Amy! I had no idea that there were four different entrance tickets. As for buying them in advance, I’ve often been told not to buy them in advance. Now I know why – very expensive! Thanks for the comment, Stephen! I waited until I was IN Cusco to buy my tickets at the official office in Aguas Calientes–however, I do understand why people would get nervous about them running out and want to buy it ahead of time. Yes. I also understand why so many buy in advance, too. Particularly if they know that they won’t have all that much time. 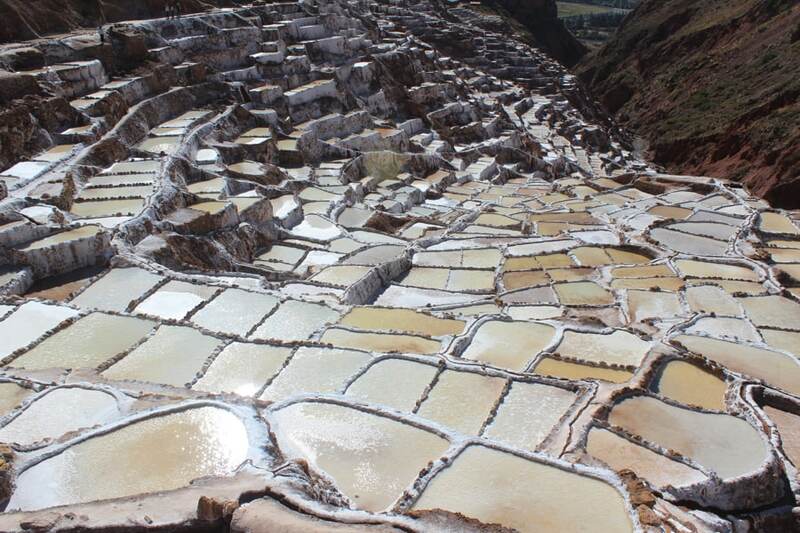 Loved your blogs on MP, quick question, is it worth taking the hiram bingham train one way? We can afford it, question is, is it worth it? Any tips? Hi Mohit, thanks for visiting The Wherever Writer blog! Hm…I’ve never personally been inside the Hiram Bingham train, so I can’t tell you if it would be worth it. I once glanced into it as it passed by, and it looks very fancy. It’s totally up to you, and if it’s in your budget, just remember that Machu Picchu is usually a once-in-a-lifetime experience, so it may be worth the splurge. On the other hand, there are a lot of other activities you could do with that money. Either way, let me know what you decide! 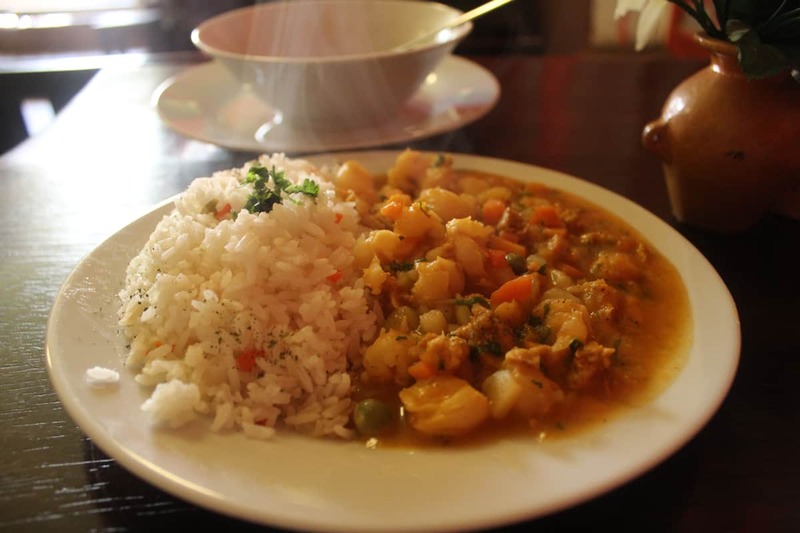 Enjoyed reading your blog on 15 things you should know before going to Machu Picchu. i will be visiting in a week and I’m traveling alone. I have a very short visit – arrive saturday morning depart monday evening so I’m trying to make sure I make the most of it. I was quoted $1600 for a tour company to make all my arrangements which I thought was outrageous since I requested 3 star hotels. I’m hoping not to go that route but I did want to arrange for a guide and the tickets ahead of time. What is the best way to handle that. Also, wondering if it’s nest to stay 2 nights in Cusco or one night there and the other in Aguas Calientes. Also thinking of walking to MP once I get to Aguas Calientes rather than taking the shuttle bus. Is it worth it? I’m not going to be able to do any hiking so I thought the walk would make up for it. Any recommendation for a solo woman traveler? anyway, Regarding this site: Do they have a lot of nice souvenir shops that sell nice replicas/models of Machu Picchu? also Does the ticket have an image of the Machu Picchu site for visitors to keep? And do the tickets look different based on what option you buy? I enjoy keeping a ticket with a nice photo of the site as well as an accurate replica of the site. Rio was perfect in that sense with their Redeemer statue replicas and tickets with a great image of the statue (sugar loaf mountain was great in that ticket regard too), and I was hoping Machu Picchu would be the same way. I realize this is an old post, but thought I’d clarify. There is no bus to Agua Calientes from Hidroelectrico. Once you reach the end of the dirt road at Hidro you must walk 2-3 hours following the railroad tracks to Agua Calientes. Also the powers that be have plans to install a gate and guard to collect additional fees from intrepid adventurers for the privilege of coming in the “back door” to Machu Picchu.